Discussion in 'General DIY' started by JonathanTaylor, 11 Dec 2011. For the past 2 weeks, there has been an intermittent buzzing/humming noise which seems to be coming from my chimney. 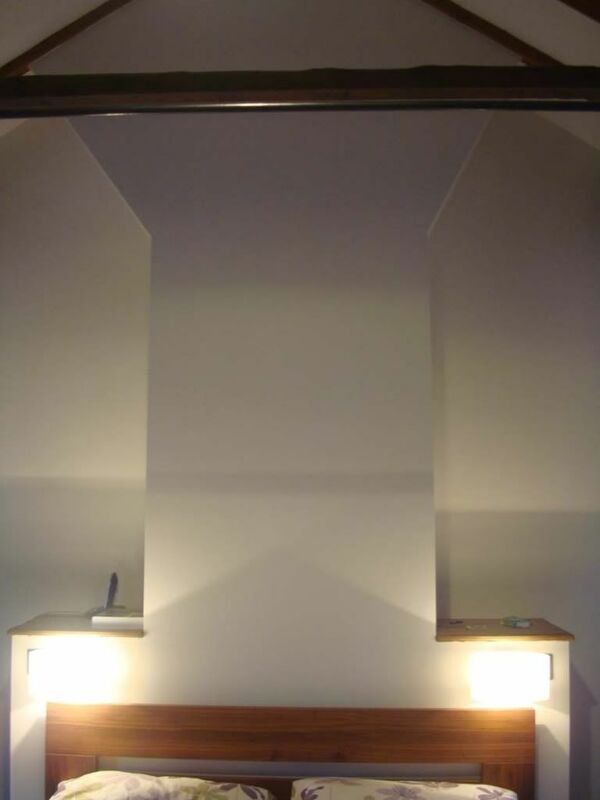 The chimney runs from a woodburner in my living room and passes through my bedroom (pic below). I have only noticed the noise at night. The fire is generally lit from about 16:00, so the chimney has been hot (but is cooling down) when the noise occurs. The power cables to my house run from a telegraph pole and terminate on the outside of my bedroom wall behind the chimney. I have had the electricity company out to check that it is nothing to do with this and they have confirmed it is not. I have tried turning off the power to my house at the fuse box, but that does not affect the noise. I have tried opening the woodburner doors while the noise is happening, to see if it comes down the chimney, but the noise does not get louder if I open them. For this reason, I thought it was not wind blowing down the chimney and resonating, but now the electricity company have said it is not the power cables, I am wondering again whether it is the chimney or the chimney lining. Inside my bedroom, the chimney is encased in some stud work (as shown in pic above) and I think the noise is echoing around in there and that is making it worse. There is a tv aerial attached to the wall near to the chimney. I cannot tell whether this is making the noise though. The sound is quite like the noise a tuning fork makes, but it is continuous, sometimes getting louder / softer, and sometimes not there at all. It was happening last night, and there was some wind - but not a major amount. There is wind outside right now, but it is not happening. We have lived in this house for the past two years and the noise has only recently started. The house is detached and we are very rural, so I do not think it is coming from anything other than something on our house. The first part of this video is outside my bedroom window - the buzz is just audible out there. The second half of the video is inside my bedroom, up against the chimney, and is really loud. Picture here showing the electric cables which the power company checked. Also shows the aerial, what I think is a phone cable (not checked) and the chimney. Any ideas about how to fix this appreciated. fitted into the ends of the aerial mast. Have you got a cowl on your chimney,it may be at a certain wind speed it resonates, but it sounds like an extractor fan running. No cowl on the chimney. Agree it sounds like an extractor fan, or a transformer, but I have turned off the power to the entire house and it still persists, so we can rule that out. Wind vibrating the aerial mast could act like a large tuning fork causing noise. I have the same problem, the humming/buzzing only occurs when the wind is light and only from a particular direction and as your problem varies in intensity from soft to quite loud with a few seconds of nothing at all then starts again, after seeing the photo of your aerial it is identical in detail to the one we have with the same mounting bracket. We live in a bungalow and the sound transmits down our bedroom wall and if it starts during the night can keep me awake for hours, I have wrapped rubber around the pole and between the two holding clips and that seemed to act as a damper to the vibration and cured the problem but now the weather has gone colder the rubber has probably hardened and is now transmitting the vibration noise again, as someone replied to your post it is like a tuning fork. My theory is that the shape of the plastic clips on the horizontal bar that holds the series of small rods to it on the aerial are vibrating in a breeze whereas when the wind is strong the frequency generated is insufficient to cause the noise. 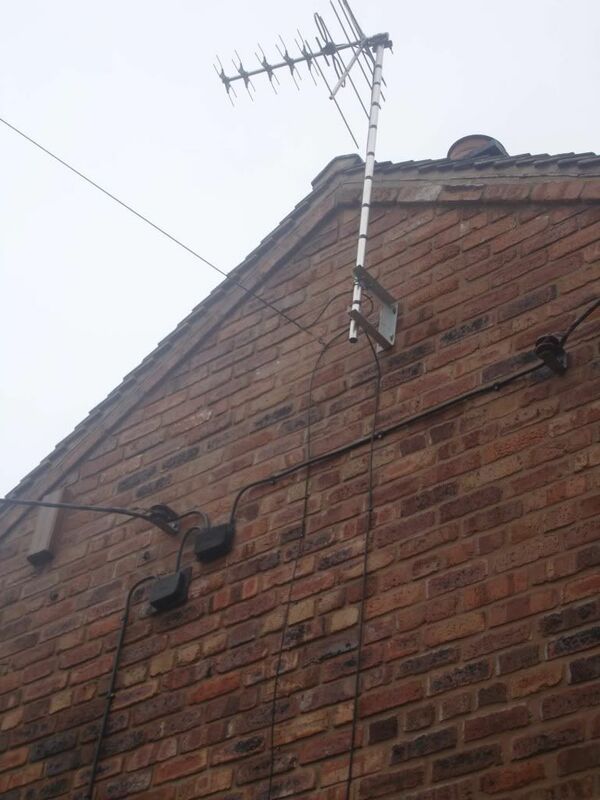 Have you sorted your problem and if so how, the next step for me is to change the aerial to a different design but I thought I would check with you before doing so. I have not resolved it yet. I have now noticed it occurring during the day time too, and when the fire was out was able to get my head inside the woodburner. After getting closer, I can hear the sound within the chimney itself. I spoke to a chimney specialist and they said in their experience it would be one of two things: either the aerial vibrating or the chimney lining vibrating (fixable by backfilling the lining with some insulating material). My plan is to borrow someone's ladder to get to the aerial and make sure that is securely fastened and nothing feels loose. I will be sealing the ends of the tube per the advice in an earlier post too, and making sure it is tightly secured to the bracket. If that does not work, I will remove the aerial and see if that helps. Last resort will be getting the chimney lining backfilled, as the guy who I spoke to said it would be expensive (did not discuss how much yet). Is your noise also coming from a chimney area, or directly through an external wall? If possible either put your ear against the pole or use a screwdriver, rod or anything that you can use by placing one end of the object against the pole and the other against your ear and if it is the aerial it will increase the sound that you hear, that is how I confirm the aerial was the problem, I also capped the tube ends off, didn't make one iota of difference. My next move is to change the aerial making sure that it is not fitted with the same type of plastic clips that secure the elements to the horizontal rod as these appear to be the offending items that are causing the vibration. Fingers crossed that this cures the problem, I shall not be doing this until the weather calms down and shall report the results on here. Aerial could do with another bracket as high on the wall as possible to reduce vibration. Foxhole, thanks for the suggestion, unfortunately it's not possible to do that as the present bracket is as high on the brickwork as possible, talking to a guy at Maplins he reckons that the present pole 11/2" dia. (40mm) is too rigid thus creating a 'tuning fork'effect and that by replacing it with a 1" dia. (25mm) one may be more flexible and may cure the problem and as I intended to fit a new 1"dia. pole with the new aerial I may as well try that before 'shelling out' on the new aerial. It was getting to the stage where I was considering going for a Free Sat system but after adding up everything required to match what we have now it became too expensive and complicated plus apart from this problem the digital signal we have now is brilliant and runs three tv's through a signal booster off the one aerial. Does not look that way from pic, another 60cm or so above current bracket before roof. That's not my house Foxhole, that belongs to the originator of the topic Jonathan Taylor, I posted a reply because I have the same problem. I have an aerial guy coming round to look at it (my aerial, not ballsacre's....) on Monday. Will talk to him about adding a new bracket as well and see what he thinks. Good luck! Jonathan, I have decided to do the same, pressure from the Mrs as she's now saying I shouldn't be climbing ladders now I'm in my seventies, I suppose she's right. Quick update: I had an aerial man round on Monday who swapped the aerial for one where the small rods are not connected to the horizontal bar using small plastic clips - but more like the old fashioned type where it is a metal to metal connection. After he removed the old aerial, I can now see that it is possible to wobble the rods where they connect to the horizontal bar - the plastic clips are not completely tight. So far, fingers crossed, we have not heard the noise again. I will post again if it reoccurs.